Do Delivery Apps Deliver for Chefs? I placed my first online food delivery order just over four years ago. It must’ve been one of those days when you’re so tired and hungry that you can’t even make a solid decision about what to eat. It worked, providing an easy solution, and I’ve been using GrubHub (founded in 2004) ever since. The company merged with Seamless—another online food delivery service founded in 1999—in fall 2013 and its stock is trading at $35.36 a share as of Sept. 29, nearly $10 higher than at its initial public offering in April. Together, GrubHub and Seamless processed approximately $1.3 billion in gross food sales in 2013, according to their prospectus, and the company—now known as GrubHub Inc.—is banking on its ability to offer an efficient and pleasant experience for both consumers and independent restaurants around the country. At least a dozen other companies have sprouted up over the past couple of years looking for a niche in this now highly competitive and lucrative marketplace for takeout and delivery, including Caviar and Fluc—both founded in early 2013—which see potential at higher-end restaurants that historically haven't offered takeout or delivery. It might seem counter-intuitive at first—isn’t half the fun of eating high-quality food the experience of being served freshly plated dishes, while a waiter replenishes your wine and oh so delicately refolds your napkin while you run to the restroom? He owns Paulie Gee’s (a pizza joint) in Brooklyn that eliminated takeout this month. “There’s a chance that the character of the food will change” as it sits in a box, particularly for pizza, he said. And just as important, take-out orders were affecting sit-down service. A lot of his customers aren’t happy about the decision, though, he said, and he’s willing to compromise on the issue if he can find a pizza delivery box that doesn’t ruin the crust or make it soggy. But he’s still reticent to use any third-party delivery services. 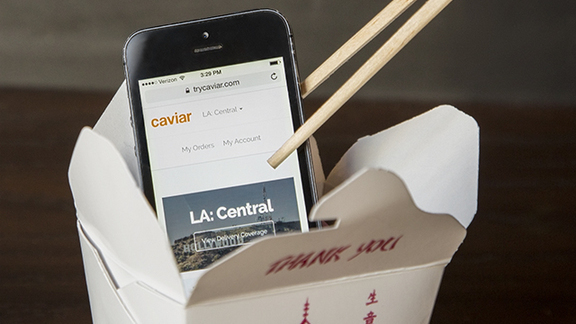 Caviar addresses this concern by collaborating directly with the restaurants featured in its app. “We work closely with each restaurant and take photos of each individual menu item, so we can help each restaurant showcase their new dishes and reach more customers,” Caviar CEO Jason Wang told Chefs Feed via email. And it seems to work. Yusho, a Japanese-inspired Chicago restaurant, has been using Caviar for corporate lunch catering since May 2014. It has allowed the restaurant to expand its takeout options while preserving predictability for the kitchen. While Yusho offers a special catering menu on Caviar that’s not part of its normal dinner service, other restaurants offer individual menu items for on-demand delivery orders. Both Fluc and Caviar charge a flat fee, from $6 to $10, while Postmates’ fee starts at $5 (depending on the distance for the delivery) plus a 9 percent service fee. Offerings and fees may vary widely but there’s sure to be a delivery app that suits every appetite and budget now and in the future. Or, you can always just Push for Pizza.